This wedding was a blast. Kim and Regan were fun and very easy to work with.... our type of clients. 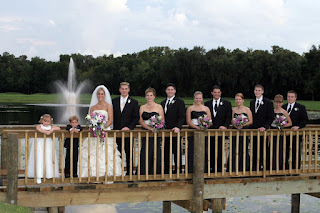 The wedding took place at a beautiful golf course in Central Florida. Mix that with beautiful weather, an awesome couple and loving friends and family and you have the perfect wedding. Here are a few samples. Let us know what you think. More to come later. ENJOY!! !